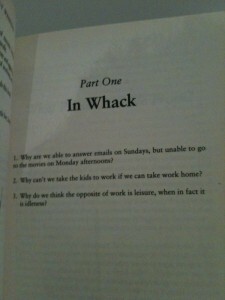 Robbie Mackay (@rjmackay): His blog posts, whilst short and sporadic deliver bursts of insight. Andrew Weaver (@drewmaniac): Mixing it up, he shares great content, ideas and my favourite photo finish friday. Louis Rosas-Guyon (@louisrosasguyon): Great ideas, from a technical focus, give it a read. Give them a read, follow them, send them a tweet. At the least subscribe for a few weeks, get a taste of what they’re up to. And I’ll be honest, I can only highlight and engage with those who I know are reading, if you have a blog send it my way… the worst that’ll happen is I place a comment or two. It is so true – no matter your stance someone can always come up with a solid reason why you are wrong. Don’t stress about being 100% right, you just need to be less wrong than those you compete with. Tom Peters share’s an amazing analogy in his book The Little Big Things. A colleague of his said instead of saying to kids, you’d better eat your food there are kids in Africa starving he was saying you’d better study, there are millions of kids in India studying to take your job. Huge switch in mindset. But as markets open up it makes complete sense. If you’re not pushing, innovating or rethinking – what are you doing? You know the kind, “can’t do that, it’s not my job”. It’s very easy (for me or anyone to say) they shouldn’t exist. Truth be told, the fact that they exist in an organisation often reflects the companies culture. However if you can change their attitude in such an environment, it’ll help, make the swing. Reward initiative, reward ideas, reward risk. Most of all reward those that sidestep their job description to get the job done. Communicate for what you want to be, not what you are. Just wish more small businesses would do this! Communicate for what you want to be, not for what you are. In their outward communications, sending a strong message, which is bigger than what they are. Then they can actually grow to that point. It’s that confidence and reassurance that helps you get there. Consumers can smell insecurity a mile away. It’s as if you snap your fingers and wham you’re idea has gone viral. At least that’s what clients seem to expect. And as such the three words, “make it viral” get appended to a brief. That’s all fine and good but hey, how often do things actually go viral? 24 hours of video is uploaded every minute to YouTube and growing. But only a very tiny miniscule percentage of those go viral. Every marketer will give you their view on what it takes to go viral, however I like to get scientific with it. As mentioned above the phenomenon is based on viruses, so what makes a pathological virus tick? How do you get an idea to replicate itself? I have my own description but for the purposes of this post, let’s lean on HowStuffWork’s content. “Regardless of the type of host cell, all viruses follow the same basic steps in what is known as the lytic cycle . A virus particle attaches to a host cell. The particle releases its genetic instructions into the host cell. The injected genetic material recruits the host cell’s enzymes. The enzymes make parts for more new virus particles. The new particles assemble the parts into new viruses. The new particles break free from the host cell. Well a virus is only one or two genetic sequences, it relies on the host cell to finish the process. In other words keep the story short and let the receiver interpret and built it out. In other words you start it, the receiver finishes it. Further your message needs to be in the right place at the right time to attach to a host (and receive it). Virus can then infect the person and carry on. There are varables which ‘halt’ the process, ie antibodies and frequency. If the virus (or idea) is not new to the subject, they have a latent repulsion to it, that is they are less likely to be overcome by the virus and spread it. This is often the hinging component in viral marketing, is this idea novel enough to our market? As if it isn’t it won’t spread. It needs to be different enough to overcome the antibodies. Frequency of infection is also something else to consider, if you are constantly surrounded by sick people you are also likely to get sick. Marketers need to consider the frequency of which they expose people to their message. Then the virus will spread. You can then achieve a ‘viral effect’. However even in this case, you don’t want everyone to be infected with your idea, you just want a target market to be. It’s a waste of time and resources to try and attract people who have no interest in your topic. This is where companies have a real opportunity to infect a hive of people with their idea. Narrow down your market, make it super specific, then apply the methodology above. You are far more likely to get a viral effect, I know it won’t have the millions of views that boost your ego but hey effective communication is going to help you out more than being popular on YouTube for 15 minutes of fame. Not a bad quote, it’s from a great post I read over at the Do Blog – Dealing with haters. Very valuable advice, we often forget when we respond to criticism that we’re really talking to everyone else, not the recipient. I’ve had a huge influx of readers this year (awesome! ), thanks for coming along you’re very much appreciated. Shining the light briefly (for all my new readers) on my first book The Best Ideas are Free. It’s done hugely well, I’m very proud of it, and it delivers a lot of punch for what it is. ““The best ideas are free, but it’s hard to know where to find them. Check out this book! Many of them are collected here.” (From Chris Guillebeau of the Art of Nonconformity Blog). “None of these 63 ideas are long-winded. At most each will take two minutes to read, but the value of the ideas comes not from their brevity (or perhaps it does). The ideas are not new, but some are startling in how they make your head ‘snap’ in recognition of their ‘rightness’. Read it online in your browser. You can grab a copy off Amazon or off the Kindle Store (it’s only a buck on the Kindle). If you’d like to print it out yourself, you can grab a pdf here (it does cost a few dollars). Also as a final offer you can order below for $23.99usd/copy. And I’ll ship you a signed copy, anywhere in the world. Just click the button below, follow the process and email me [email protected] if you have any issues. This is the last time I’ll offer the opportunity to buy a signed copy The Best Ideas are Free on the blog, so do so whilst you can. At the very least read it online, grab it on Kindle, ideas are better shared and spread. For all my older readers you can expect the next addition in the final quarter of this year. It’s coming along very very well. I will keep you updated. You cannot reasonably expect that any information shared online is completely private. The reality is that we do. People gossip on Twitter, slant people on Facebook or even upload videos to YouTube. Hell everyone can admit to saying something via email they regret…. Let me explain to you why it’s dead. Firstly if what you are sharing is juicy enough, the people that see it will get it out, just look at failbooking.com (yes they blur the names) but you get the point, if it’s newsworthy enough it’ll get out. Michael Phelps found this out when photos of him with drug paraphelia popped up on Facebook – sure enough someone within his network leaked it. So that’s the biggest sieve – YOU and ME. We can’t be trusted. Everyone is hackable, like the first point, we all have security leaks. Whether it’s the fact all our passwords are the same, we leave our email logged in or our forgotten password questions are weak. My point is, in a targetted attacked all of us are vulnerable, Sarah Palin even had her Yahoo email hacked during the US election. How? They guessed the answer to her secret question. If it’s online and can be identified as coming from you, chances are someone can eventually access it. That’s not even getting into how your data is transferred. Under recent law changes ISPS in New Zealand (and many places around the world) have internet filters on, to ensure people don’t access a blacklist of websites, for obvious reasons they don’t publish the list of websites (which rightfully scares some people). However this means, somewhere along the line a computer program is examining the website you’re looking at to see if it’s a ok.
Further the path from your computer to the recipient is loose, work emails for example are often monitored (and archived). If you work in the public sector policy is to retain a copy of all emails. Even then your information is often not secure, frequently instant messaging services do not encrypt their communications, meaning people can snoop in on the conversation. The longevity of information online is virtually indefinite (in terms of our lifetimes) lets say you say something you regret via email so delete it. However if the recipient doesn’t also do the same… it can pop up again in the future. Online communications leave a breadcrumb… which can be followed. In short, do not share information you don’t reasonably expect to pop up again at some point in the future. It’s just dumb. Too complex. Too fast. No foundation. That’s what happens when a project is rushed. It gets too complex too fast with no foundation. And then you end up with inferior results. Slow down, do the dance, get to know each other. Plan for success. Or if you can’t slow down, in the shorter timeframe, increase the relationship building efforts. Meet everyday. Twice a day. Or twice a week. Whatever – make sure you build up that relationship the best you can. 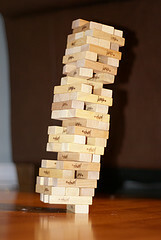 Otherwise you end up with a wobbly jenga tower, which will collapse, given a nudge. 1) Obsess about your customers. It seems changing the colour of a hospital gown to skin colour significantly helps doctors ability to detect health problems (based on the change of colour of their skin). Interesting huh? And along the same lines. The fake bus stop in Germany outside a rest home. As Alzheimer’s patients wander off (from the home) they go to bus stop to catch the next bus. Of course buses don’t turn up but it acts as a capture point, whereby the nurses can assist them once they come back to reality. Immoral or moral? I suggest a best case answer to a difficult problem. The point is, modifying contextual factors can completely change the outcome. Controlling the context to reach favourable outcomes. The first helps doctors do their jobs better and the second helps nurses (and patients) deal with Alzheimer’s. (Thanks to Springwise & Radiolab for passing that on). Who else is fighting for attention? Each of which is competing for my attention. To be honest that’s hard work (it’s hard for me to even pay attention and care about all these events). As that’s a better win.